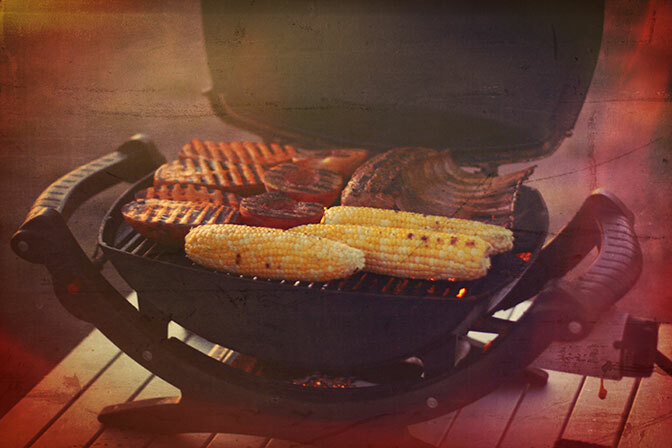 Cook lamb, peaches, corn, and sweet potato on your outdoor grill. Watch the video below to see Richard, founder of My Camp Kitchen, explain step by step how to make a perfect lamb chop. It is surprisingly easy and oh, so good! Charcoal or gas grill. I frequently use a Weber Q. Mix up equal parts of garlic powder, curry powder, black pepper, and salt. Set aside. Note: This is so tasty, you may want to make enough to put in a shaker for future use. It’s also good on grilled chicken. Trim excess fat from the cap. Leave a thin layer or remove completely (your choice, either is good). Rub lightly with olive oil to help hold the rub. Coat all surfaces generously with the rub. Cover and hold until everything else is ready. Cut each washed potato in half lengthwise. 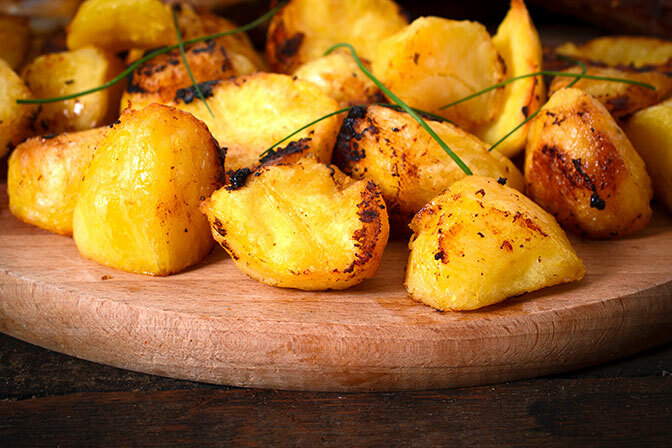 Sprinkle olive oil on the cut side each potato and rub to spread the oil across the whole surface. Cut each peach in half and remove the pits. Drizzle olive oil on the flesh and rub to ensure the whole surface is coated. Rub lightly with olive oil and salt to taste. If using gas, preheat the grill to high, then turn down to medium. If using charcoal, start a generous number of coals—in the neighborhood of 55 to 65. Wire brush the grill surface to remove prior remnants of charred food. When the coals are lit, spread evenly and tightly in a single layer. Start with grilling the lamb. Turn every 5 minutes. On medium, it will take 20 to 25 minutes (four to five turns) to get to medium-rare. Time each turn. If flare-ups occur, remove from the heat and sprinkle the flames with a tiny amount of water. To test for doneness, use a meat thermometer (135 degrees F for medium-rare), make a cut, or use your finger to check the firmness. After the lamb has been on for a couple of minutes, place the potato halves face down on top of the grill. Rotate periodically. Keep on the grill until the potato is tender. Place the peaches face down on top of the grill about 10 minutes after the lamb. Check periodically. Rotate to not burn the peach. Dark coloration is caramelized sugar from the peach, which is normal. The corn goes on last since it is the fastest to cook. Place on the grill about 14 minutes after the lamb. Rotate the ears of corn to cook all sides. When the lamb is done to your liking, remove to a plate and cover with foil and hold for 5 minutes. Remove the corn, potatoes, and peaches when finished to your liking (should be close to the time you remove the lamb). Cut the lamb between the bones into eight individual chops and arrange them on the plate. Place a generous handful of greens on the plate and put the tomatoes and asparagus on top. My preference is to have a hearty Cabernet or Syrah with this meal. I’m usually enjoying the wine while I’m cooking. Learn about our outdoor cooking equipment at our website. Check out our Videos page to see other demonstrations and our Recipes archive for more outdoor cooking recipes. Do you want to camp in luxury? Let’s go glamping! Glamping emphasizes ease and luxury while camping. It’s about enjoying the outdoors with less hassle. While a fairly new phenomenon, glamping is fast growing in popularity. You can glamp in luxury tents, yurts, tree houses, or even teepees, usually cozied up in a framed bed with plush linen and comforters. Often meals are provided at an additional cost. You get to be one with nature without the hassles of setting up camp, sleeping on the ground, and using outhouses. One of the most comprehensive websites for glamping destinations worldwide is Glamping Hub. By having the right gear, you can make your own camping experiences more luxurious while enjoying the freedom to go where you want to go. You can create your glamping experience in your favorite national or state forest or even your backyard. How fancy or glamorous you make it is up to you. It does not have to be difficult or costly, but to really enjoy yourself, you will need top-notch cooking gear. 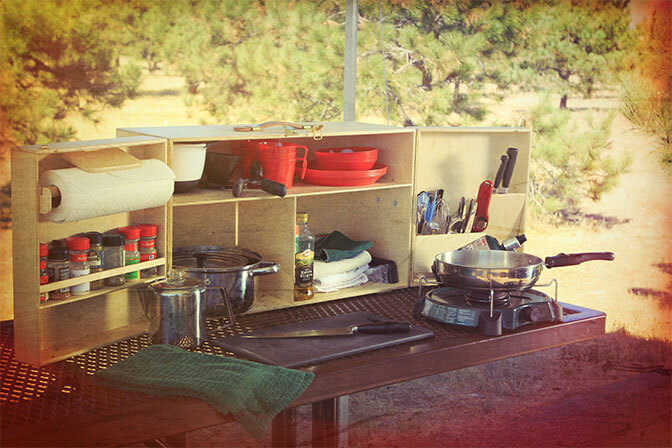 We have several camp kitchens that make cooking outdoors easier and more comfortable. Our kitchens are crafted for ease of set-up and use. With the strength and beauty of hardwoods, classic joinery, and sturdy hardware, they are built to last. If you are looking for a more deluxe version, then you should consider our Summit. Check out our full line of My Camp Kitchen outdoor cooking products. A few months ago, I shared a recipe for my delicious Spitfire-Roasted Chicken with Grilled Veggies. Today I want to share with you all one of my favorite morning recipes: an omelet in a bag. When you’re in a hurry to get out and enjoy your favorite camping activities, you need a breakfast that is substantial and nutritious but easy and quick to cook. 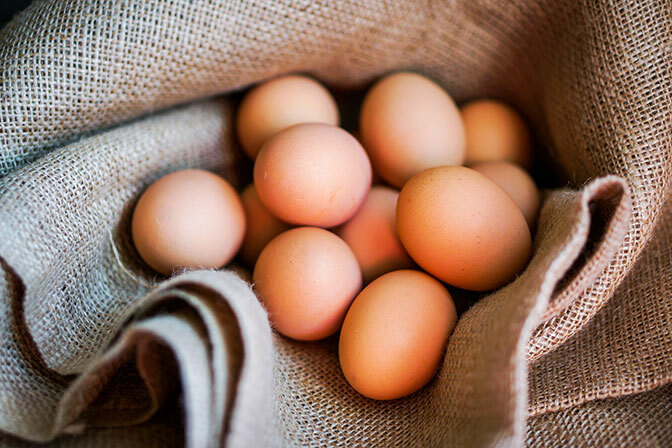 As long as you cut and prepare the fillings ahead of time, an omelet in a bag only takes 6–10 minutes to make. Plus, it is packed with flavor and protein, making it convenient, healthy, and delicious, too! For a fun breakfast group activity, have everyone make their own omelet! This will also ensure each omelet is filled with the right amount of ingredients. While preparing your omelet, bring a large pot of water to a boil. Using your portable kitchen and cooking supplies, beat the eggs until the yolk is well mixed. Place eggs into the baggie. Add your preferred filling ingredients to the bag. When it is full, zip the bag shut and gently massage to blend everything together. You might want to label your bag with a sharpie to prevent using the wrong ingredients. Place your mixture into the boiling water and let cook for roughly 6 minutes (more or less depending on the firmness you prefer). When done, remove and place in a bowl or on a plate to enjoy! Who says you can’t cook while camping? As long as you have the right tools, preparing a delicious gourmet meal out in the woods is easy! Before your next trip, make sure you have these eight tools for camp cooking. Not every meal has to be grilled or prepared using a stick. There are plenty of camp stoves available that are lightweight and easy to pack. If you’re going to bring a stove, you’ll need some pots and pans, too! This can be forgotten easily. When packing your knife, make sure you put a plastic cover over the blade for protection. Bring along a spatula that can handle both heavy and lightweight foods. That way you can use the same spatula while cooking your steak and potatoes. You’ll need a place to store your kitchen items and prepare food. Pack a portable kitchen to make camp cooking a breeze. It would be frustrating to bring cans of beans and vegetables and then not be able to open them! If you’re preparing a late-night meal, a headlamp can help you see so you avoid injury. It’s a lot more convenient than trying to hold a flashlight. Before you prepare each meal, make sure your pots, knives, and spatulas are clean. 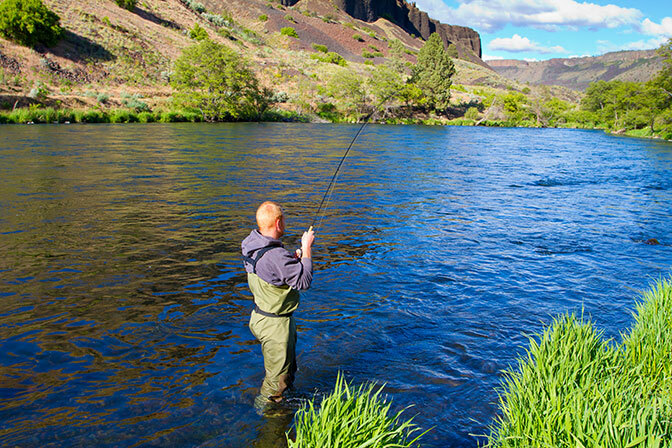 When washing dishes, keep at least 200 feet away from the lake or river so you don’t impact the natural environment. Camping as a vegetarian doesn’t mean you have to fill up on just sides and snacks. There are plenty of healthy vegetarian camping recipes that are both delicious and nutritious, and even the meat-eaters on your trip will enjoy them! Here are three to get you started. Kick your bland potatoes up a notch. This recipe is packed with flavor and can be served with your favorite veggies. In a large bowl, mix your ingredients together. Place your mixture in several layers of aluminum foil and then seal the edges. Position a wire rack over the hot coals and place your aluminum packet on top of the wire rack. Cook for 30 to 40 minutes, flipping the packet midway through cooking. These potatoes also make great side dishes for those on your trip who still want a burger. You don’t need meat to get a healthy dose of protein. This salad includes veggies and black beans to keep you energized and full. To make the dressing, use a whisk to mix the vinegar, sugar, and oregano. Season with salt and pepper, then slowly add the oil while whisking. Blanch the asparagus and green beans. Blanching is when you drop vegetables into boiling water briefly and then place them in ice-cold water immediately afterward for a minute or two. Combine your carrots, black beans, and green beans in a mixing bowl. Drizzle your dressing on top, mix thoroughly, and serve. As long as you have the right supplies and a portable kitchen, cooking gourmet meals is easy! This recipe offers a nice break from your typical camp food. Heat 2 tablespoons of vegetable oil in a saucepan on medium heat. Add garlic and season with salt and pepper. Cook until garlic is softened. Add couscous and cook for about 5 minutes or until golden brown. Add your water and thyme sprig and reduce heat to medium-low. Then cover the pan and let the couscous simmer for about 8 minutes. Remove the pan from the stove and stir in the zucchini. Cover once more and let the pan sit for about 5 minutes. Stir in the pine nuts, currants, and remaining olive oil. What are your favorite vegetarian recipes? Leave a comment and let us know! In the summer, there’s no better way to spend your time than to go camping. Still, little inconveniences can sometimes diminish the experience. Enjoy your trip even more this summer by following these 10 camping tips. Cardboard does little to prevent your matches from getting wet. Use a small plastic container instead. When you need ambient lighting to fill your whole tent, attach a head lamp to an old milk jug. This simple trick will light up your space in an instant! If you prefer a natural insect repellent, simply burn a bundle of sage to keep the bugs away. 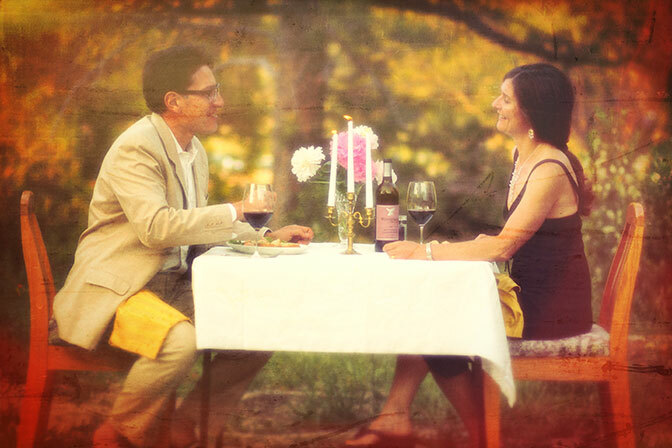 There’s no reason why you can’t eat delicious, gourmet meals while camping. Pack a variety of spices in your portable kitchen to keep meals from tasting bland. Don’t have a coffee maker? No problem! Simply place ground coffee in a tea bag, close it with dental floss, and then let it soak in hot water. When smoking meat or vegetables, place rosemary right on the coals to enhance the flavor. There’s nothing more uncomfortable than wearing old or wet undergarments, so be sure to pack extra! Almost any meal you want to create can be made using a foil packet. Don’t forget to pack this useful item on your next trip. Along with wearing protection like sunscreen and hats, take some time to relax in the shade now and then so you don’t wake up in pain the next morning. If you plan meals ahead of time, you can make sure you have all of the necessary ingredients for your trip and won’t be forced to eat hot dogs every day. There’s no reason for camping to be difficult! These 10 tricks will help make your camping experience easier and more enjoyable overall. For the past few weeks, I’ve been sharing a variety of great healthy camping recipes, but today, I want to share with all of you one of my favorite camping recipes: Spitfire-Roasted Chicken with Grilled Veggies. On camping trips, we like to do a lot our cooking over the fire pit with a spit, and you’ll soon learn why if you try out this recipe. Cooking your meat over the fire creates a very different flavor from simply roasting it in the oven. The fire gives the chicken a smoky flavor that is simply to die for. 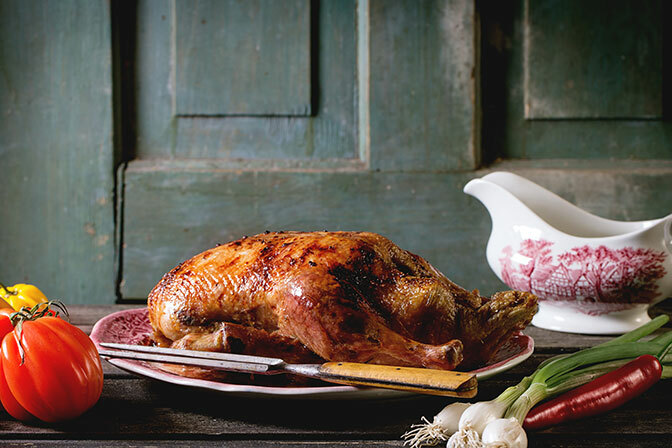 While this recipe calls for chicken, keep in mind that you can also do rotisserie cooking with spare ribs, a rack of lamb, or prime rib as well. Prep the chicken. Using a knife, create an opening in the skin of your chicken and slide slivers of garlic underneath at 2- to 3-inch intervals. Then oil the chicken evenly and douse with salt, pepper, and sage. Set up your spit. To create hot coals, start a fire and then let it die down until the flames are no more than 6 inches from the wood. Then center the spit over the fire (you’ll want to do this without the chicken to get the correct placement). Turn spit outward and put chicken on the rod. This step can be tricky because you want a good tight fit so the spit turns the chicken with it. If your spit comes with prongs, use those to hold the chicken in place. Cook the chicken. Turn the spit so the chicken dangles over the fire. Depending on how hot the fire is, you may need to adjust the spit’s height to prevent the chicken from burning. Keep stoking the fire and adding wood, if needed, to keep the flames low. The chicken should gently sizzle and become golden over time. It should cook for one hour. Cook the veggies. This step won’t take long, so you can wait to cook your favorite vegetables until you’re near the end of the hour. Prep the veggies first with spices and olive oil (I like grilled asparagus marinated in a blend of olive oil, garlic salt, and pepper). Then you can either grill or steam your veggies for 10 minutes. Check the temperature. After cooking your chicken for an hour, use a meat thermometer to make sure the meat is done; it should be at least 165 degrees. Then cut up the chicken, serve, and enjoy! With a portable camp kitchen like the Summit, it’s now much easier to cook gourmet meals while camping. That said, it’s always a good idea to have a few easy meals in mind for when you’re tired and need a break from cooking. These easy camping meals are still healthy, and they require little work to prepare. 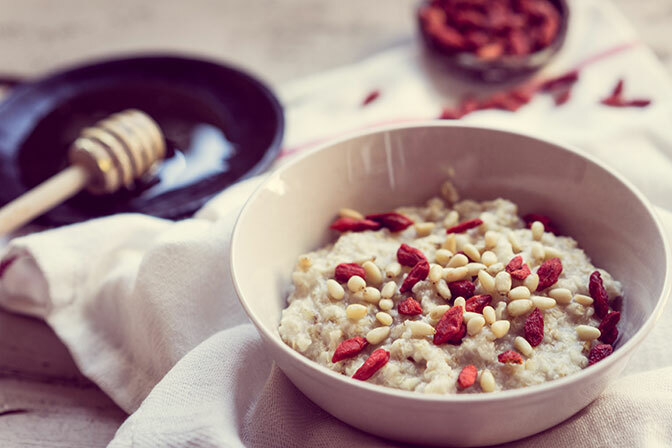 Oatmeal is perfect for breakfast because it comprises whole grains and is substantial enough to keep you energized throughout the day. All you need are instant oats, water, and any toppings you might like to include. When buying instant oats, be sure to look for Original and avoid buying flavored packets, which contain added sugar. After cooking your oatmeal, add fruits, nuts, and other healthy toppings as desired. Nutritious food can also be delicious if you choose the right meals. This salad is refreshing on a hot summer’s day and is great if you have any vegetarians camping with you. All you need are black beans, mangos, a sweet red bell pepper, onions, cilantro, olive oil, lime juice, and a dash of salt. To make this meal even easier, prepare the salad beforehand and store it in a cooler. That way, all you’ll have to do is serve the meal when you’re ready for lunch. When you’re burnt out from a full day of activities, take it easy and make grilled chicken tikka for dinner. Before your camping trip, simply marinate boneless chicken pieces in a mixture of tandoori paste and plain Greek yogurt, then freeze it in a Ziplock bag. Make sure the chicken is fully thawed before grilling. Instead of bringing along a bag of potato chips for an easy snack, cut up vegetables like carrots and broccoli that the family can snack on throughout the day. If you don’t like to eat veggies plain, hummus is a healthy alternative to vegetable dips. Camping can be exhausting, so give yourself a break now and then with these easy and healthy camping meals. 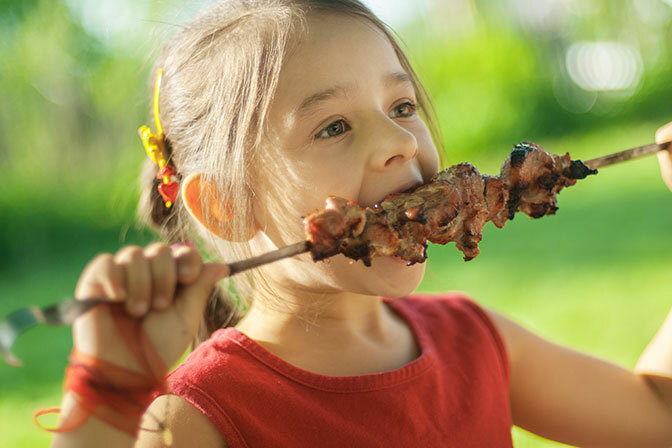 When you think of “traditional camp foods,” what comes to mind? Probably s’mores and hot dogs, right? If that’s the case, then maybe it’s time to throw something new into the mix. Many campers stick with typical camp foods because it’s what they know, but you can easily branch out and create a whole new menu with the right cooking kits like the Outdoorsman and these three camping recipes. Swap out those hot dogs and hamburgers for a healthier alternative. With lean meat and veggies, chicken kebabs make healthy eating easy! Put the chicken pieces, olive oil, garlic cloves, and spices into a large ziploc bag. Marinate overnight. Soak skewers in water overnight while chicken is marinating. Arrange your chicken and veggies on the soaked skewers. Sprinkle kebobs with salt and pepper. Grill for 2 minutes on each side, turning three times. Sick of eating s’mores every night? Try using apples to make a deliciously sweet dessert instead. After washing apples, remove apple cores, making the hole about 3/4-inch wide. Dig out seeds with a spoon. Combine sugar, cinnamon, raisins, and pecans in a small bowl. Then stuff each apple with this mixture. Wrap apples in aluminum foil and set in coals, baking for 15–20 minutes. Going fishing on your trip? If you have a lucky day, take advantage of the fish you catch and use it to make lemon dill grilled fish filets! Use olive oil to grease bottom of foil sheet and place fish filet on top. Sprinkle each filet with pepper and 1/4 of the salt and dill. Use half your lemon and squeeze juice over fish. Slice the other half into rings and then place the rings on top of the fish. Drizzle olive oil over fish. Fold sides of foil and tightly seal. Place foil packets over smoldering coals for 3 minutes, then flip and continue cooking for 3 more minutes. Remove foil from fire and wait 5 minutes before eating. You don’t have to suffer hot dogs and hamburgers every night of your camping trip. When you’re stuck in a meal rut, these best camping recipes will hit the spot.